Great Barrington is a town in Berkshire County, Massachusetts, United States. It is part of the Pittsfield, Massachusetts, Metropolitan Statistical Area. The population was 7,104 at the 2010 census. Both a summer resort and home to Ski Butternut, Great Barrington includes the villages of Van Deusenville and Housatonic. It is the birthplace of W. E. B. Du Bois. In 2012, Smithsonian magazine ranked Great Barrington #1 in its list of "The 20 Best Small Towns in America". Great Barrington today is a vibrant small town acting as the hub for "South County". The town and its surroundings support a year-round population as well as second homes. Great Barrington is home to over 55 restaurants catering to a wide spectrum. The recently renovated Mahaiwe Theater has become a center for year-round music and cultural events. The Mahican Indians called the area Mahaiwe, meaning "the place downstream". It lay on the New England Path, which connected Fort Orange near Albany, New York, with Springfield and Massachusetts Bay. On April 25, 1724 Captain John Ashley of Westfield, Massachusetts bought on behalf of himself and a committee of the Massachusetts General Court the land that became the towns of Great Barrington, Sheffield, Egremont, Alford, Mount Washington, and Boston Corner for £460, three barrels of "sider," and thirty quarts of rum from 21 Native American sachems headed by Conkepot Poneyote. The Konkapot River in southwestern Massachusetts is named after him. The village was first settled by colonists in 1726 and from 1742–1761 was the north parish of Sheffield. In 1761, it was officially incorporated as Great Barrington, named after the village of Great Barrington in Gloucestershire, England. In the summer of 1774, 1,500 men shut down the Berkshire County Court in response to British oppression. In the winter of 1776, Henry Knox passed through Great Barrington while transporting the cannon from Fort Ticonderoga to the Siege of Boston. Due to his time in the area, he established an agricultural interest in the area of Great Barrington. With the arrival of the railroad in the late 19th century, Great Barrington developed as a Gilded Age resort community for those seeking relief from the heat and pollution of cities. Wealthy families built grand homes called Berkshire Cottages here, as others would in Lenox and Stockbridge. Among the earliest estates was that built by New York City banker, industrialist and art patron David Leavitt, who built an elaborate 300-acre (1.2 km2) estate, and was soon followed by those of his sons nearby. Leavitt was instrumental in the development of the local Housatonic Railroad, serving as its president. Later estates included Searles Castle, commissioned in 1888 by the widow of Mark Hopkins together with her second husband, Edward Francis Searles, and "Brookside", built for William Hall Walker. In 1895, Colonel William L. Brown, part owner of the New York Daily News, presented Great Barrington with a statue of a newsboy, now a landmark on the western edge of town. In March 1886, the water mill at Great Barrington was the site of an experiment that first used water to drive an alternating current generator. A transformer was used to increase the voltage, and the current was transmitted over a mile away to the nearest town to power street lights. The town was the site of an F4 tornado around 7:00 PM on Memorial Day, May 29, 1995. The tornado killed three people and caused damage in the area. Great Barrington is the birthplace of W. E. B. Du Bois, an African-American academic and civil rights activist, most known for being one of the co-founders of the National Association for the Advancement of Colored People (NAACP) in 1909. Du Bois was born on February 23, 1868, at a house later replaced by present-day Route 23 would run. As a child, Du Bois attended the Congregational Church. Many of these church members donated the funds needed for Du Bois to attend college. Du Bois lived in the town until he was seventeen. The W.E.B. Du Bois Boyhood Homesite has interpretive trails and a walking tour. Arlo Guthrie's song "Alice's Restaurant," which runs for 18½ minutes, is based on true-life events of the late-20th century in Great Barrington and the adjoining towns of Stockbridge and Lee. The Old Trinity Church, which was the home of Ray and Alice Brock at the time of these incidents, and is now owned by Guthrie, is at 4 Van Deusenville Road in Great Barrington. On October 18, 1990 Richard Stanley purchased the old Miller Hotel, also known as the Barrington House. Stanley started to upgrade the building, evicting tenants who had been involved in drugs. He removed the 1960s aluminum facade and returned the historic building through renovation to its 1929 appearance. On November 15, 1995 Richard Stanley and Joseph Wasserman opened The Triplex Cinema in the heart of Great Barrington. This contributed to further developments in the town, changing the economy and enhancing its desirability by providing a place for community events. With increased appeal as a destination, the town attracted new restaurants and retail shops, which opened on both Main Street and Railroad Street. Both streets previously had many vacant shops. The Berkshire Eagle reported that Great Barrington had 50 places to eat in a town of 7,700 people. On July 24, 2009, Great Barrington was named an Appalachian Trail Community by application and acceptance by the Appalachian Trail Conservancy. On June 1, 2010, a new fire station was opened for the Great Barrington Fire Department, located on Route 7. The new fire station replaced the old one, located on Castle Street. It had deteriorated and was too small for the growing needs of the fire department. The new $9.1 million facility was planned as a center for community events such as elections. It serves as the hub for emergency operations in southern Berkshire County. The town celebrated its 250th anniversary with a large parade on July 10, 2011. Other events celebrating the 250th anniversary were held throughout the year as well. The "Main Street Reconstruction Project" was launched in 2011, involving major improvements along Main Street between Saint James Place and Cottage Street. The plan elements include new pavement, new sidewalks, sewer and utility improvements, and the removal of the large trees that span Main Street, to be replaced with much smaller trees. The project had finished its design phase as of 2012, and construction was to be completed by the end of 2013. According to the United States Census Bureau, the town has a total area of 45.8 square miles (118.6 km2), of which 44.8 square miles (116.1 km2) is land and 0.97 square miles (2.5 km2), or 2.09%, is water. Great Barrington is bordered by West Stockbridge, Stockbridge and Lee to the north, Tyringham to the northeast, Monterey to the east, New Marlborough to the southeast, Sheffield to the south, Egremont to the southwest, and Alford to the northwest. The town is located 20 miles (32 km) south of Pittsfield, 46 miles (74 km) west of Springfield, 135 miles (217 km) west of Boston, and 134 miles (216 km) north-northeast of New York City. Great Barrington is located within the valley of the Housatonic River. The Williams River, Green River and several brooks also flow through the valley into the Housatonic. To the east of the river, several mountains of the Berkshires rise, including East Mountain (site of the Ski Butternut resort (also known as Butternut Basin) and a state forest), Beartown Mountain (and the majority of Beartown State Forest) and Monument Mountain. The Appalachian Trail crosses through East Mountain State Forest in the southeast corner of town. The southwest corner of town is the site of several country clubs and a fairgrounds. U.S. Route 7 passes through the center of town, and was once part of New England Interstate Route 4 (also known as the New York-Berkshire-Burlington Way). Massachusetts Route 23 passes from west to east through town, combining with Massachusetts Route 41 and U.S. Route 7 in the western part of town and Massachusetts Route 183 in the eastern part of town, which also follows part of the path of Route 7 northward from Route 23 before splitting towards the village of Housatonic. Great Barrington is located approximately 12 miles (19 km) south of Exit 2 of Interstate 90 (the Massachusetts Turnpike), the nearest interstate highway. As of the census of 2000, there were 7,527 people, 3,008 households, and 1,825 families residing in the town. By population, the town ranks fifth out of the 32 cities and towns in Berkshire County, and 202nd out of 351 cities and towns in Massachusetts. The population density was 166.6 people per square mile (64.3/km²), ranking it eighth in the county and 268th in the Commonwealth. There were 3,352 housing units at an average density of 74.2 per square mile (28.6/km²). The racial makeup of the town was 94.74% White, 2.09% Black or African American, 0.16% Native American, 1.25% Asian, 0.03% Pacific Islander, 0.70% from other races, and 1.04% from two or more races. Hispanic or Latino of any race were 2.07% of the population. 17% were of Irish descent, 12% Italian, 11% German, 10% English and 9% Polish. There were 3,008 households out of which 27.3% had children under the age of 18 living with them, 45.8% were married couples living together, 11.5% had a female householder with no husband present, and 39.3% were non-families. 32.6% of all households were made up of individuals and 13.3% had someone living alone who was 65 years of age or older. The average household size was 2.28 and the average family size was 2.89. In the town the population was spread out with 22.6% under the age of 18, 9.0% from 18 to 24, 23.5% from 25 to 44, 26.2% from 45 to 64, and 18.8% who were 65 years of age or older. The median age was 42 years. For every 100 females there were 87.2 males. For every 100 females age 18 and over, there were 83.8 males. The median income for a household in the town was $45,490, and the median income for a family was $53,135. Males had a median income of $38,163 versus $29,474 for females. The per capita income for the town was $22,655. About 3.4% of families and 7.2% of the population were below the poverty line, including 6.6% of those under age 18 and 4.5% of those age 65 or over. Great Barrington employs the open town meeting form of government, and is led by a board of selectmen and a town manager. Great Barrington has its own public services, including police, fire and public works departments. The town has two libraries, with the main branch, Mason Library, located at 231 Main Street in Great Barrington, and a branch library, Ramsdell Library, located at 1087 Main Street in the village of Housatonic, both of which are part of the regional library network. The town is home to Southern Berkshire District Court, as well as Fairview Hospital, the largest hospital in the southern end of the county (based on the number of beds). On the state level, Great Barrington is represented in the Massachusetts House of Representatives by the Fourth Berkshire district, which covers southern Berkshire County, as well as the westernmost towns in Hampden County. In the Massachusetts Senate, the town is represented by the Berkshire, Hampshire and Franklin district, which includes all of Berkshire County and western Hampshire and Franklin counties. The town is patrolled by the First (Lee) Station of Barracks "B" of the Massachusetts State Police. On the national level, Great Barrington is represented in the United States House of Representatives as part of Massachusetts's 1st congressional district. Democrat John Olver of Amherst has represented the district since June 1991. Great Barrington has a paid by call Fire Department, The Great Barrington Fire Department (GBFD), which consists of about 40 members and 5 pumpers, 1 Tower Ladder (Ladder 1), 2 Rescue Vehicles, and 1 Brush Truck (545). Most members are trained to the First Responder level and some are trained to the EMT-Basic level. 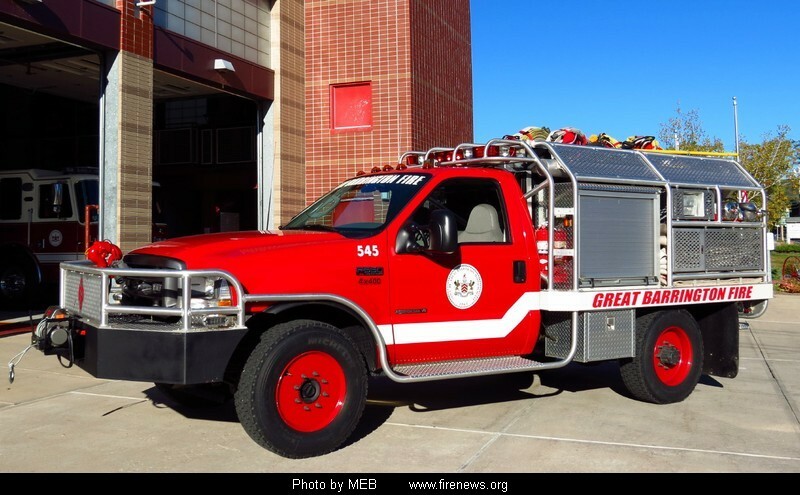 The Fire Department responds to about 600 calls per year, which vary but are not limited to mainly fire alarm activations and medical emergencies. Great Barrington's Emergency Medical Services are covered by Southern Berkshire Volunteer Ambulance Squad Inc,also known as "SBVAS", operated from the grounds of Fairview Hospital. The service provides 24/7/365 paramedic level service to the towns of Great Barrington, Housatonic, Alford, Egremont, Sheffield, Ashley Falls, Monterey, and Mount Washington. SBVAS is the primary paramedic intercept service for ambulances going into Fairview, including New Marlborough, Sandisfield, and Otis The squad consists of a mix of full time EMTs and Paramedics and Volunteer EMTs. The squad runs anywhere from 3,000 to 5,000 calls a year. Great Barrington offers the use of its own local currency, called BerkShare notes. There are about 844,000 BerkShare notes in circulation worth about $801,800 at the current exchange rate of one BerkShare to 95 U.S. cents, according to program organizers. The paper money is available in denominations of one, five, ten, twenty, and fifty. Proponents say that the currency gets residents to shop at local stores. Local areas may have their own currencies as long as they do not resemble the United States dollar and are in paper only. Great Barrington is the largest town in the Berkshire Hills Regional School District, which includes the towns of Stockbridge and West Stockbridge, and the villages of Housatonic, Glendale and Interlaken. All three school levels are located in Great Barrington. Muddy Brook Regional Elementary School offers pre-kindergarten through fourth grade classes and is located off Route 7 in the northern part of town. Monument Valley Regional Middle School offers grades five through eight. Monument Mountain Regional High School (MMRHS) opened in 1968, consolidating the former Searles High School in Great Barrington and Williams High School in Stockbridge, and serves the high school students of the district. Students from Otis and Sandisfield also attend the school as part of a tuition agreement for high schools. The town of Richmond maintains an agreement with the district that gives its high school students an option to attend MMRHS. The school's athletic teams are called the Spartans, and their colors are maroon and white. Sports are offered at the junior varsity and varsity level for the students to participate in, including football, soccer, baseball and softball, swimming, track and field, tennis, and more. Several of the sports teams have heated rivalries with the Lee High School Wildcats, in Lee, Massachusetts. The town is home to several private schools, including the Rudolf Steiner School, the Great Barrington Waldorf High School, and the John Dewey Academy. Great Barrington is home to Bard College at Simon's Rock, which was the first-ever early college, and remains the only accredited four-year early college program in the country. Also located here is the South County Center of the Berkshire Community College. The nearest state university is Westfield State University. Great Barrington plays host to the American Institute for Economic Research. AIER was founded in 1933 as non-profit scientific and educational organization. Originally located at MIT, it relocated to the southern shore of Great Barrington's Long Pond in 1946. Great Barrington is served by the Berkshire Regional Transit Authority, which offers bus transportation throughout Berkshire County. Peter Pan Bus Lines and Greyhound Lines have stops in Great Barrington for long-range bus transportation. The town lies along the Housatonic Railroad line, which roughly follows Route 7 and the river through southern New England. Walter J. Koladza Airport is located in Great Barrington, and features a full service FBO for general aviation aircraft. The nearest international airports are Bradley International Airport in Windsor Locks, Connecticut, and Albany International Airport in Albany, New York. Great Barrington is served by a local weekly newspaper, The Berkshire Record, and a weekly shopper, The Shoppers Guide. The town also gets newspaper delivery from The Berkshire Eagle of Pittsfield. The former second town newspaper, The Berkshire Courier, has gone out of print. The masthead of the Courier was incorporated by the Berkshire Record in 1995. Great Barrington is in the Albany, New York, television market, with three Springfield TV stations appearing on the cable lineup: WWLP (NBC 22), WGBY (PBS 57), and WSHM-LD (CBS 67). The town is served by Time Warner Cable out of Lee. ^ a b "Geographic Identifiers: 2010 Demographic Profile Data (G001): Great Barrington town, Berkshire County, Massachusetts". U.S. Census Bureau, American Factfinder. http://factfinder2.census.gov/bkmk/table/1.0/en/DEC/10_DP/G001/0600000US2500326815. Retrieved December 18, 2013. ^ Strzempko, Adam. "Great Barrington tornado 14 years later". WWLP.com. http://www.wwlp.com/dpp/news/local/wwlp_local_great_barrington_tornado_14_years_later_200905281710. Retrieved 13 June 2010. ^ a b Lewis, David Levering (2009). W.E.B. Du Bois: A Biography. Henry Holt and Co. Single volume edition. pp. 11, 14, 15, 39, 40. ISBN 978-0-8050-8769-7. ^ "W.E.B. Du Bois National Historic Site". W.E.B. Du Bois National Historic Site. http://www.duboisnhs.org. Retrieved December 19, 2013. ^ a b "Town Welcomes New Station With Open Arms". The Berkshire Eagle via YellowBrix. http://firelink.monster.com/news/articles/13102-town-welcomes-new-station-with-open-arms. Retrieved 23 August 2012. ^ a b "Main Street Reconstruction Project". Town of Great Barrington. http://www.townofgb.org/Pages/GBarringtonMA_Procurement/Main%20Street/Index. Retrieved 23 August 2012. ^ "Some communities are printing their own currency", CNN, 22 April 2009. Retrieved on April 22, 2009. ^ "Noel Phyllis Birkby Papers, Sophia Smith Collection". Smith College. 1998. http://asteria.fivecolleges.edu/findaids/sophiasmith/mnsss3_admin.html. Retrieved 12 Aug 2011. Wikisource has the text of the 1920 Encyclopedia Americana article Great Barrington. This page uses content from the English language Wikipedia. The original content was at Great Barrington, Massachusetts. The list of authors can be seen in the page history. As with this Familypedia wiki, the content of Wikipedia is available under the Creative Commons License.